This instrument arrived at our workshop in relatively good conditions, considered its age. 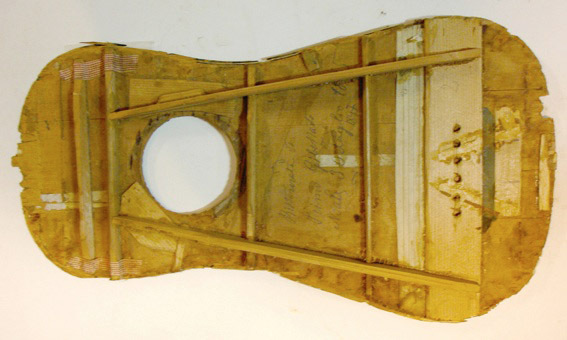 The neck had been shortened, the rose was missing (glue could be felt under the mouth), the top was unfolded and the ribs somewhat lifted to the back to make it a flat guitar with gut strings rather than a “battente” with metal strings. Traces of worms were visible on the ribs. Holes for nails were filled but still visible. The instrument had been set with 6 gut strings, a piercing bridge, then set again in “baroque” with a glued bridge for 5 courses. The top was very damaged at the joint top/neck and on its edge where some purflings were missing, but in general in rather good condition. 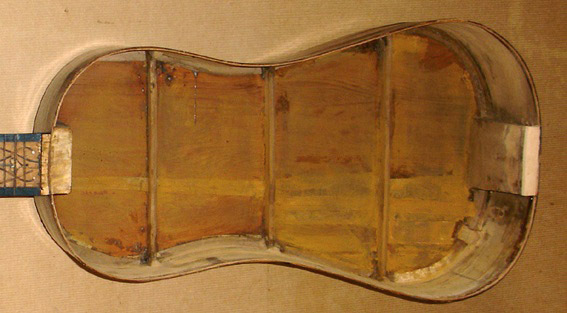 The upper part of the top and the fingerboard show traces of various and successive frets. the peg holes on the head were too large for some and tapped for others during the set up of the 6 strings. The top is in good condition, almost with no cracks; therefore, the owner is asking for an “efficient” restoration, not “cosmetic”, that is to restore the instrument as close as possible to its historic condition, not just as a decorative instrument. 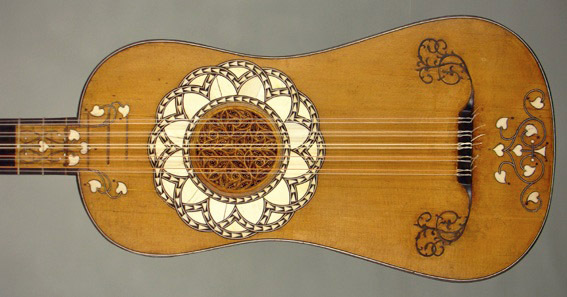 During the centuries this guitar went through at least 4 modifications, more or less following the evolution of the musical practice. The question is: to which stage of its history should we adapt our restoration? Should we try to bend the top again and make it return to its original state: “battente” with metal strings or keep the unfolded top and restore the guitar as it was after this first modification and set it with gut strings? The top was in a rather good condition; it had been cleverly unfolded and it would be risky to intervene again on the fold, so together with the owner we decided to put the instrument back together without taking risks and keep this first modification as the museum curators say “part of the instrument’s history”. strings, set up and final adjustments. Before starting this delicate restoration, we looked for similar instruments that could serve as models and guide for our work. We opened the guitar to take a look at the set up and discovered the enormous modifications and the signature of one of the last interveners’. We also noticed that a label was removed, not necessarily the author’s; more probably, one of the restorers. There was no mark of fire on the top’s reverse, which tends to confirm the folded top in the origin, the fold sustaining the top enough so the makers would not have to draw his poker all around before closing the box. 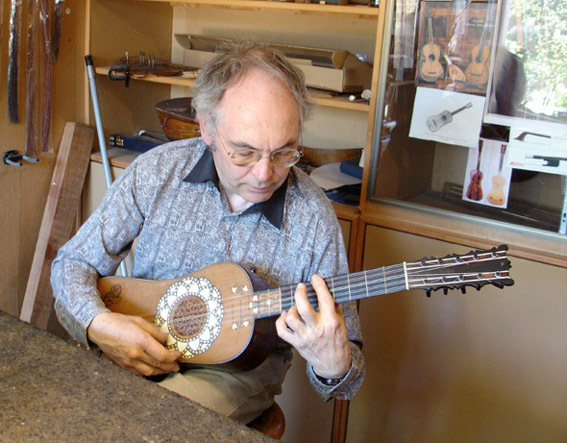 This instrument is of a rather small size, and the neck has been shortened. 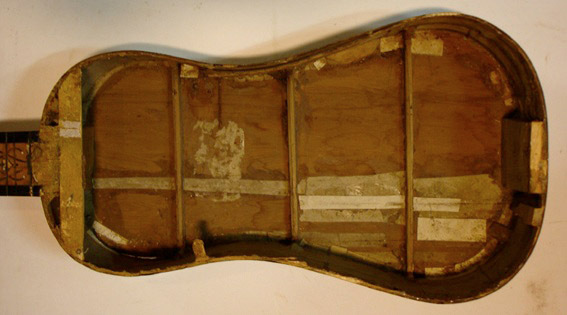 Traces of former frets visible on the top indicate the position of the 12th fret, around 3cm under the joint top/neck, as the major part of Italian baroque guitars that we examined. 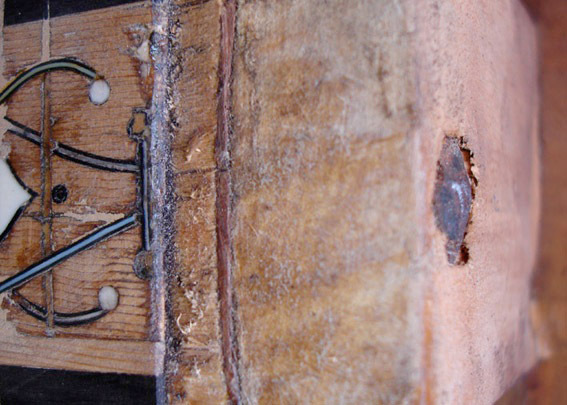 The bridge position determined by the 2nd modification (gut strings) was also visible and was perfect to place the new bridge. The distance, 12th fret/bridge gave us the length of the vibrating string and the exact dimension of the piece to be added to the neck. 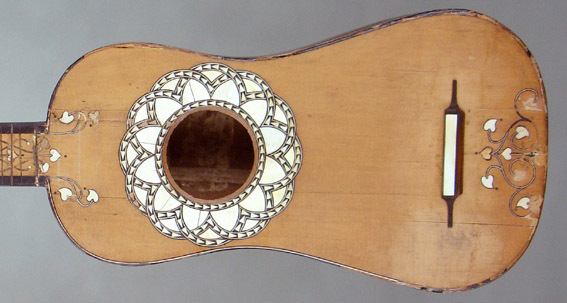 At this stage of the restoration, we observed the décor ornating the instrument and noted an important detail: a small black dot signals each heart inlaid in the top, its design and the interlace technique are particular. We find in the collections only one guitar presenting this particularity: it is signed by Pietro Railish and is kept in the National Germanisches Museum in Nuremberg (ref. MI 58). The lower part of this Railish is covered with veneered apocrypha ivory-ebony intended to hide the part eaten by the worms and to reinforce it. This apocrypha decoration is hiding the motive of the lower part of the top, but the upper part shows exactly the same design of entrelac and hearts as “ours”, and the design of the rose is very close. The purfling of the neck and the back of the head are quite similar to those of a luth by Railich in the MIM of Brussels. A Domenico Sellas kept in the Shrine to Music Museum in the United States shows a similar design, even though in mother of pearl instead of ivory. This is not a formal proof of identification of the maker who made this guitar, but these similarities lead us to this authentification: Railich/Sellas. Pietro Railich, born in 1615, leaves the Fussen area to follow the corporation regulations. We can trace him in 1625, only 11 years old, as an apprentice with Matteo Sellas in Venice where he worked as late as 1641. His brother, Matteo Railich, worked in Brescia in 1655, town of violin makers under the same corporation regulations as those in use in Venice. For more information see Stefano Pio: “violin and lute makers of Venice – 1640-1760”. 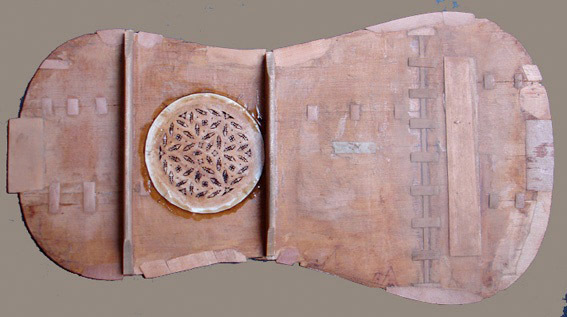 These instruments, all characterized by a flat rose in parchment, we asked Elena dal Cortivo to make a copy. We also noted that the purflings ornating the outer line of the rose were similar to those seen on a bass guitar made by Sellas kept in Leipzig. We know another nice guitar made in Venice around 1630 that shows exactly the same decorations on the top, hearts and “entrelac” a flat rose in the same décor of the mouth. This guitar, played today, is unfortunately anonymous, but it will serve as a model to elaborate the drawing of the “moustache”, together with another Sellas borrowed from a private collection. After opening the box, we discovered the numerous modifications of the bass bar and the pieces that make the top too heavy. This old restoration is signed “Primo Gibernato Noales”, dated July 30th 1897. We could not find anything around this name in our dictionaries. We removed the numerous added braces and observe the set up: it is typical of the making in Venice in the beginning of the 17th century. After having cleaned the inside, we tapped some worm galleries both inside and outside, replaced the paper stips when too damaged and not playing their part anymore, cleaned and glued the fractures on the top and apply some cleats. Finally, we filled the groove where it was folded with a long wooden splice, and to sustain the top without too much weight, we placed thin epicea cleats on the fold at regular intervals. This will allow to make the top more rigid when the strings will be set up. We filled again the peg holes on the bridge and installed a very thin epicea counter bridge to compensate the weakness created by the holes. We calculated the piece to be added on the neck: 37 mm. We removed the head from the neck, restored it and set it aside. After having unmounted the fingerboard – not original nor reusable – we made the piece on the fingerboard and its crafting, then we applied the purflings and the veneer on the back of the neck to match those existing. We glued the head back. Then, we adjusted half-edges where missing on the outside of the top that will help with closing the box, then added the small pieces of epicea missing on the outside before applying the splices, then the bone hearts. The missing inlay and the composed purfling. We made and glued the new bridge (in copy), the “moustaches” and glued the rose. Then, we glued the top of the instrument. We made and applied the composed purflings missing in their position and around the edges. Then, after a general cleanup, we work on the color for the added pieces now on the guitar. We applied the gut frets and set the instrument also with gut strings. We tried to give back to this guitar its aesthetics and its function, as close as its historical truth and respecting its characteristics and its personal story and modifications. We wanted, without risking to damage the instrument and the testimony that it can bring us, to make a non aggressive restoration: nothing was removed, lost, modified, and remissible; everything can be unglued, taken off and cleaned. “Invisibility” of restoration – matter very dear to the curators of the French museums – is for us still a phantasm, an utopia, the restorations are as discreet as possible, with adequate material, and do not interfere either with the legibility, conservation or use of the instrument. This entry was posted in Construction and repair and tagged baroque guitar performer spanish guitar classical restoration building. Bookmark the permalink.